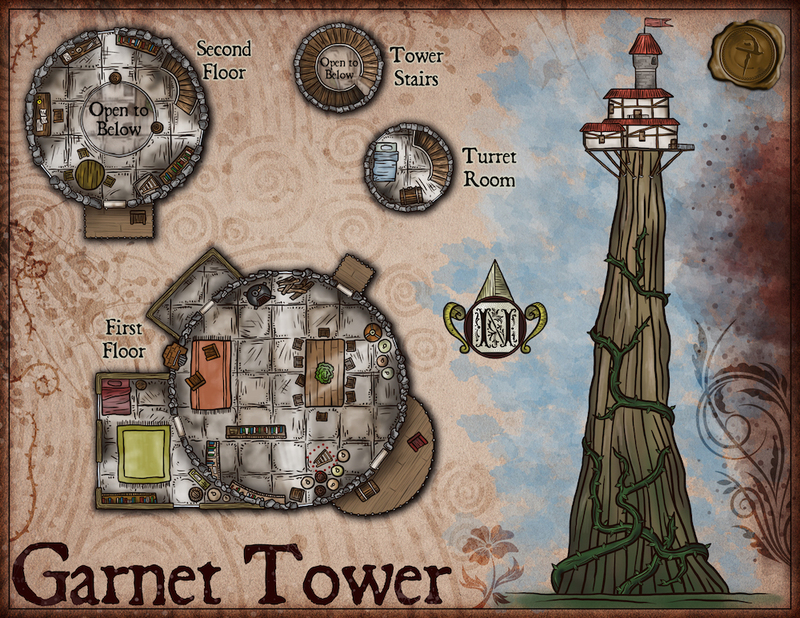 This resource features the general description of a lonely tower in the middle of the forest. The elven princess inside refuses to go back to her kingdom. 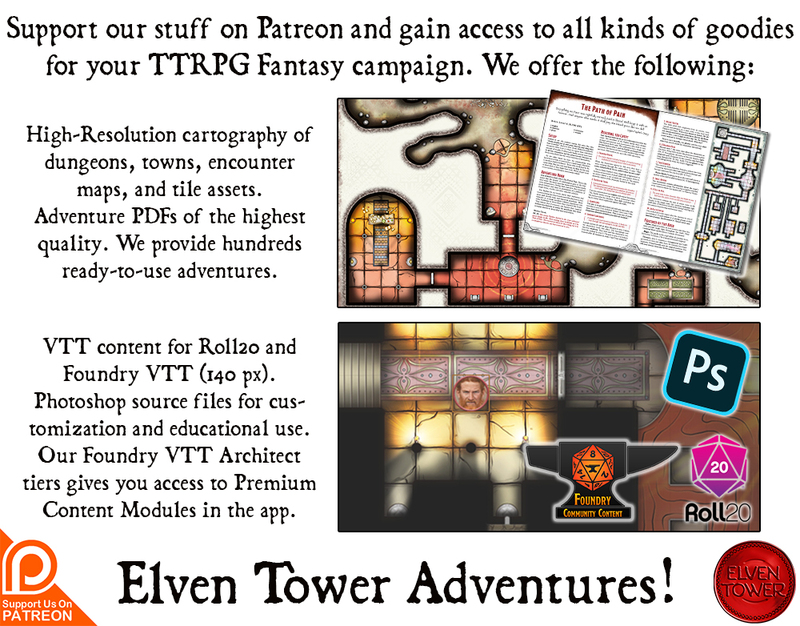 It includes adventure ideas that are appropriate for high-level (Level 9+) adventuring parties. Challenge Rating (CR) is calculated using a party of four as the model. There is a state of emergency in the elven kingdom. The current ruler, King Davioseis, is sick. The royal medics predict he will die in a short time. King Davioseis is an extremely old elf. His sickness comes from old age but it is his depression that makes him worse as each day passes. The king had only one daughter during his lifetime, Princess Pereia. The princess left the kingdom almost three-hundred years ago to study astronomy and runes in faraway lands. She was called back to the elven kingdom almost fifty years ago, as his father’s health started to fail. They only received a letter saying that she was not interested in taking her place on the throne. It came as an unwelcome surprise, but no one worried all too much because elves have very long lifespans and Princess Pereia might still be persuaded in time. Princess Pereia is 492 years old. She left the kingdom when she was 200 years old. She is a powerful spellcaster who wishes to learn more about the stars, celestial bodies, and ancient runes. She traveled far away, stopping in big metropolis only to acquire exotic lenses and spyglasses for hey night sky explorations. Princess Pereia was not alone on her travels. Her faithful companion was a sentient tiger named Walla. A druid in the elven kingdom gave Walla her consciousness and extended her lifespan to that of an elf through sylvan magic. Princess Pereia and Walla traveled many places across the continent in search of knowledge. She carried her finds in a magical haversack that was larger on the inside than the outside. The haversack was full of old tomes, spellbooks, magic scrolls, and star maps when she and Walla reached the Misty Forest. They heard what was nothing more than myth or gossip about a sage in the depths of the forest. This sage, as it was known, was an authority on stargazing and the interpretation of night sky formations. The princess and her tiger the Misty Forest with wariness. They were not unfamiliar with forests, but they had also heard the place was dangerous. A few days from the forest’s edge, the canopy was so dense that sunlight could not reach the soil under Princess Pereia’s feet. The forest was unnaturally humid and misty. The misty carried with it the smell of flowers not found in the area. A state of eternal twilight pervaded the forest. Princess Pereia used her magic to determine that the forest was a planar link to the Feywild. There was no way to cross over to the other realm, but some natural aspects like the mist and humidity could come to the material plane. After a week, the princess reached the center of the forest. She encountered the sage in a cave. The person appeared to live there, like a hermit. The sage was a middle-aged man with graying hair and short white beard. He implied he had been expecting her and offered her tea and food. After a brief conversation about the constellations and runes, it was clear to Princess Pereia that this man had unimaginable knowledge. She asked if she could stay with him for a time to learn the secrets of the skies. The man agreed and then introduced himself as Vadherest. Princess Pereia eventually realized she would have to stay in the forest for a very long time. She used her magic power to raise the earth and create a rock formation that towered above the forest canopy and the ever-present mist. She built a home on top of the rock, the perfect place to look at the stars. The building had no entrance or stairs but she did not need them. With her magic, she could climb down or up in a split second. After ten years of learning with the intelligent sage, Princess Pereia discovered she had feelings for him. Without noticing it, she had fallen in love with the hermit. One day of full moon, she confessed her feelings by singing an elven lament song. Vadherest listened to her sad intonation. The song was sad because love between a man and an elf is doomed to tragedy because of the different lifespans of both races. Vadherest then said he had two confessions to make. First, he confessed that he too had love feelings for her. This made her smile. The second confession was a more delicate matter. Vadherest explained that he had lied to her about his identity and origin. He explained that he was not a man, but a dragon. He was in fact far older than her. Princess Pereia felt a mixture of betrayal because of the lie, and happiness because dragons also enjoy long lives. Vadherest was not a great spellcaster but he had learned long ago how to appropriate the physical shape of men. He could polymorph indefinitely. Princess Pereia gasped in shock when Vadherest first revealed his true draconic form. Vadherest scales were green and his real body was bigger than an elephant. Princess Pereia considered that it made sense now how much Vadherest knew about the stars and runes. He was old and had spent far more time than her studying astronomy. They became a couple and lived in the Misty Forest for a long time. Vadherest, the green dragon, was not the princess sweetheart, though. He knew she was coming because he had seen her from a crystal ball hidden in his lair in the forest. He was aware that she was a princess, even though she never mentioned her noble heritage. Vadherest did not fool himself into thinking he could fool an elf. Elves, like dragons, have such long lives that a con game must extend to decades if it is to have any chance of working. Vadherest’s end game is to persuade the princess to take the throne after her father dies. But also to marry her so he becomes the prince consort of the elven court. They can’t do it now because they still have to find a way to polymorph him into an elf. His current polymorph ability only works for men. He learned it very young and the unlearning process is taking longer than expected. Princess Pereia is fool enough (in love enough) that she believes Vadherest’s intentions are pure. She thinks he only means to marry her. Vadherest two-hundred-year-old scam worked and she will not let anyone else step in the middle of their plans. Vadherest, on the other hand, feels genuine love for the princess but also is only using her to his advantage. Vadherest knows the situation will not last much longer because the elven king will soon die. And they will surely send envoys soon to retrieve the princess. 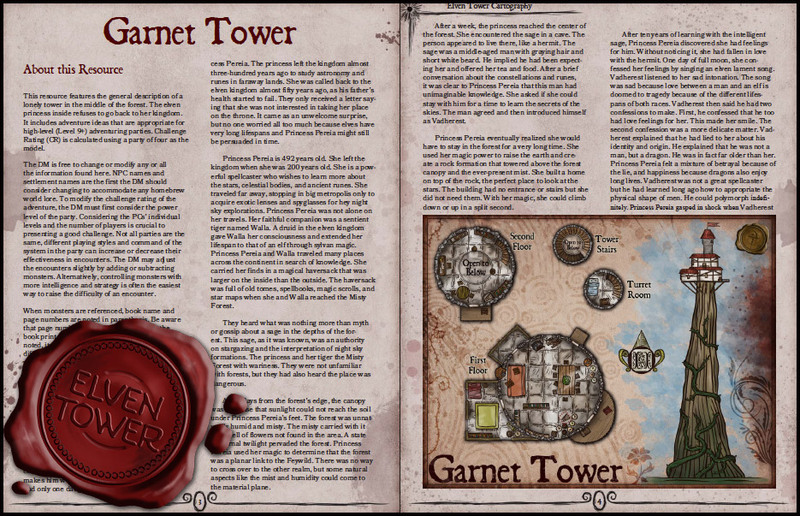 These are the general features of Garnet Tower. The tower is located in the depths of the Misty Forest. Terrain. There is dense forest around the tower, it clears 10 feet from the tower’s base. There is no entrance or stairs to the building on top of the rocky tower. Characters trying to climb to the top must make a DC 18 Strength (Athletics) check to reach the top. Failure by 5 or more means the character falls down to the base of the tower. The base of the building on top is160 high. Light. The misty forest is connected to its parallel in the Feywild. This connection manifests in the form of deep mist. Dim light is prevalent. Visibility is limited to 60 feet. The building on top of the tower is not visible from the base. Smells and Sounds. The ever-present mist smells sweet and flowery. There are also the smells of pine trees and forest fungi. The songs of unseen birds break the usual silence from time to time. In a situation like this, the elven kingdom court can hire the adventurers to travel to the Misty Forest and find Princess Pereia. They have no other information about her current activities. They instruct the party to bring her back forcefully if she refuses to come. Or rescue her, in case she is in a dangerous situation that has left her unable to return so far. If the party travels to the Misty Forest and encounters the princess. She explains that she has no wish to come back because she is to marry a man soon. Vadherest introduces himself as Princess Pereia’s fiancé and begs the adventurers to return with a negative response to the elven kingdom court. He even offers a fat bag of gold for their troubles. If the adventurers wish to comply with the court’s request, they will have to fight them. If they manage to knock them out, the adventures can take her prisoner and eventually return her home. Princess Pereia is an Archmage (MM, page 342), Vadherest is an Adult Green Dragon (MM, page 94), and Walla is a sentient tiger, use the stats of the Saber-Toothed Tiger (MM, page 336) with maxed HP.